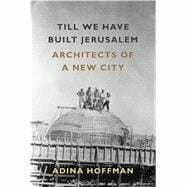 A remarkable view of one of the world’s most beloved and troubled cities, Adina Hoffman’s Till We Have Built Jerusalem is a gripping and intimate journey into the very different lives of three architects who helped shape modern Jerusalem. The book unfolds as an excavation. It opens with the 1934 arrival in Jerusalem of the celebrated Berlin architect Erich Mendelsohn, a refugee from Hitler’s Germany who must reckon with a complex new Middle Eastern reality. Next we meet Austen St. Barbe Harrison, Palestine’s chief government architect from 1922 to 1937. Steeped in the traditions of Byzantine and Islamic building, this “most private of public servants” finds himself working under the often stifling and violent conditions of British rule. And in the riveting final section, Hoffman herself sets out through the battered streets of today’s Jerusalem searching for traces of a possibly Greek, possibly Arab architect named Spyro Houris. Once a fixture on the local scene, Houris is now utterly forgotten, though his grand Armenian-tile-clad buildings still stand, a ghostly testimony to the cultural fluidity that has historically characterized Jerusalem at its best. A beautifully written rumination on memory and forgetting, place and displacement, Till We Have Built Jerusalem uncovers the ramifying layers of one great city’s buried history as it asks what it means, everywhere, to be foreign and to belong. Adina Hoffman is the author of House of Windows: Portraits from a Jerusalem Neighborhood and My Happiness Bears No Relation to Happiness: A Poet’s Life in the Palestinian Century, named one of the best twenty books of 2009 by the Barnes & Noble Review. She is also the author, with Peter Cole, of Sacred Trash: The Lost and Found World of the Cairo Geniza, the American Library Association’s Jewish Book of the Year. The recipient of a Guggenheim fellowship, she was awarded one of the inaugural (2013) Windham Campbell Prizes. She divides her time between Jerusalem and New Haven.